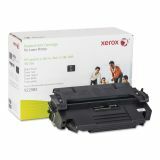 Xerox 006R00904 Replacement High-Yield Toner for 92298X (98X), 9300 Page Yield, Black - Laser print cartridge replaces original equipment manufacturer HP 92298X, R74-1003-150 and M2473G/A. Compatible with HP LaserJet 5, 5M, 5N, 5SE, Canon LBPEX, Apple Laser Writer 16/600, Pro 600, 630. Yields 9,800 pages.